Vaccination is the administration of antigenic material (a vaccine) to stimulate an individual's immune system to develop adaptive immunity to a pathogen. Vaccines can prevent or ameliorate morbidity from infection. When a sufficiently large percentage of a population has been vaccinated, this results in herd immunity. The effectiveness of vaccination has been widely studied and verified; for example, the influenza vaccine, the HPV vaccine, and the chicken pox vaccine. Vaccination is the most effective method of preventing infectious diseases; widespread immunity due to vaccination is largely responsible for the worldwide eradication of smallpox and the restriction of diseases such as polio, measles, and tetanus from much of the world. The World Health Organization (WHO) reports that licensed vaccines are currently available to prevent or contribute to the prevention and control of twenty-five preventable infections. The active agent of a vaccine may be intact but inactivated (non-infective) or attenuated (with reduced infectivity) forms of the causative pathogens, or purified components of the pathogen that have been found to be highly immunogenic (e.g., outer coat proteins of a virus). Toxoids are produced for immunization against toxin-based diseases, such as the modification of tetanospasmin toxin of tetanus to remove its toxic effect but retain its immunogenic effect. Smallpox was most likely the first disease people tried to prevent by inoculating themselves and was the first disease for which a vaccine was produced. The smallpox vaccine was discovered in 1796 by the British physician Edward Jenner and although at least six people had used the same principles years earlier he was the first to publish evidence that it was effective and to provide advice on its production. Louis Pasteur furthered the concept through his work in microbiology. The immunization was called vaccination because it was derived from a virus affecting cows (Latin: vacca—cow). Smallpox was a contagious and deadly disease, causing the deaths of 20–60% of infected adults and over 80% of infected children. When smallpox was finally eradicated in 1979, it had already killed an estimated 300–500 million people in the 20th century. In common speech, vaccination and immunization have a similar meaning. This distinguishes it from inoculation, which uses unweakened live pathogens, although in common usage either can refer to an immunization. Vaccination efforts have been met with some controversy on scientific, ethical, political, medical safety, and religious grounds. In rare cases, vaccinations can injure people and, in the United States, they may receive compensation for those injuries under the National Vaccine Injury Compensation Program. Early success and compulsion brought widespread acceptance, and mass vaccination campaigns have greatly reduced the incidence of many diseases in numerous geographic regions. 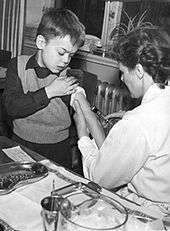 Polio vaccination started in Sweden in 1957. Generically, the process of artificial induction of immunity, in an effort to protect against infectious disease, works by 'priming' the immune system with an 'immunogen'. Stimulating immune responses with an infectious agent is known as immunization. Vaccination includes various ways of administering immunogens. Some vaccines are administered after the patient already has contracted a disease. Vaccines given after exposure to smallpox, within the first three days, are reported to attenuate the disease considerably, and vaccination up to a week after exposure probably offers some protection from disease or may modify the severity of disease. The first rabies immunization was given by Louis Pasteur to a child after he was bitten by a rabid dog. Subsequent to this, it has been found that, in people with uncompromised immune systems, four doses of rabies vaccine over 14 days, wound care, and treatment of the bite with rabies immune globulin, commenced as soon as possible after exposure, is effective in preventing the development of rabies in humans. Other examples include experimental AIDS, cancer and Alzheimer's disease vaccines. Such immunizations aim to trigger an immune response more rapidly and with less harm than natural infection. Most vaccines are given by hypodermic injection as they are not absorbed reliably through the intestines. Live attenuated polio, some typhoid, and some cholera vaccines are given orally to produce immunity in the bowel. While vaccination provides a lasting effect, it usually takes several weeks to develop, while passive immunity (the transfer of antibodies) has immediate effect. Vaccines typically contain one or more adjuvants, used to boost the immune response. Tetanus toxoid, for instance, is usually adsorbed onto alum. This presents the antigen in such a way as to produce a greater action than the simple aqueous tetanus toxoid. People who get an excessive reaction to adsorbed tetanus toxoid may be given the simple vaccine when time for a booster occurs. In the preparation for the 1990 Persian Gulf campaign, pertussis vaccine (not acellular) was used as an adjuvant for anthrax vaccine. This produces a more rapid immune response than giving only the anthrax, which is of some benefit if exposure might be imminent. Vaccines may also contain preservatives to prevent contamination with bacteria or fungi. Until recent years, the preservative thimerosal was used in many vaccines that did not contain live virus. As of 2005, the only childhood vaccine in the U.S. that contains thimerosal in greater than trace amounts is the influenza vaccine, which is currently recommended only for children with certain risk factors. Single-dose influenza vaccines supplied in the UK do not list thiomersal (its UK name) in the ingredients. Preservatives may be used at various stages of production of vaccines, and the most sophisticated methods of measurement might detect traces of them in the finished product, as they may in the environment and population as a whole. Many times these words are used interchangeably, as if they were synonyms. In fact, they are different things. As doctor Byron Plant explains: "Vaccination is the more commonly used term, which actually consists of a 'safe' injection of a sample taken from a cow suffering from cowpox... Inoculation, a practice probably as old as the disease itself, is the injection of the variola virus taken from a pustule or scab of a smallpox sufferer into the superficial layers of the skin, commonly on the upper arm of the subject. Often inoculation was done 'arm to arm' or less effectively 'scab to arm'..." Inoculation oftentimes caused the patient to become infected with smallpox, and in some cases the infection turned into a severe case. Vaccination began in the 18th century with the work of Edward Jenner and the smallpox vaccine. An inactivated vaccine consists of virus or bacteria that are grown in culture and then killed using a method such as heat or formaldehyde. Although the virus or bacteria particles are destroyed and cannot replicate, the virus capsid proteins or bacterial wall are intact enough to be recognized and remembered by the immune system and evoke a response. When manufactured correctly, the vaccine is not infectious, but improper inactivation can result in intact and infectious particles. Since the properly produced vaccine does not reproduce, booster shots are required periodically to reinforce the immune response. Virus-like particle vaccines consist of viral protein(s) derived from the structural proteins of a virus. These proteins can self-assemble into particles that resemble the virus from which they were derived but lack viral nucleic acid, meaning that they are not infectious. Because of their highly repetitive, multivalent structure, virus-like particles are typically more immunogenic than subunit vaccines (described below). The human papillomavirus and Hepatitis B virus vaccines are two virus-like particle-based vaccines currently in clinical use. A subunit vaccine presents an antigen to the immune system without introducing viral particles, whole or otherwise. One method of production involves isolation of a specific protein from a virus or bacterium (such as a bacterial toxin) and administering this by itself. A weakness of this technique is that isolated proteins may have a different three-dimensional structure than the protein in its normal context, and will induce antibodies that may not recognize the infectious organism. In addition, subunit vaccines often elicit weaker antibody responses than the other classes of vaccines. A number of other vaccine strategies are under experimental investigation. These include DNA vaccination and recombinant viral vectors. It is known that the process of inoculation was used by Chinese physicians in the 10th century. Scholar Ole Lund comments: "The earliest documented examples of vaccination are from India and China in the 17th century, where vaccination with powdered scabs from people infected with smallpox was used to protect against the disease. Smallpox used to be a common disease throughout the world and 20 to 30% of infected persons died from the disease. Smallpox was responsible for 8 to 20% of all deaths in several European countries in the 18th century. The tradition of vaccination may have originated in India in AD 1000." The mention of inoculation in the Sact'eya Grantham, an Ayurvedic text, was noted by the French scholar Henri Marie Husson in the journal Dictionaire des sciences médicales. Inoculation was reportedly widely practised in China in the reign of the Longqing Emperor (r. 1567–1572) during the Ming Dynasty (1368–1644). The Anatolian Ottoman Turks knew about methods of inoculation. This kind of inoculation and other forms of variolation were introduced into England by Lady Montagu, a famous English letter-writer and wife of the English ambassador at Istanbul between 1716 and 1718, who almost died from smallpox as a young adult and was physically scarred from it. Inoculation was adopted both in England and in America nearly half a century before Jenner's famous smallpox vaccine of 1796 but the death rate of about 2% from this method meant that it was mainly used during dangerous outbreaks of the disease and remained controversial. It was noticed during the 18th century that people who had suffered from the less virulent cowpox were immune to smallpox, and the first recorded use of this idea was by a farmer Benjamin Jesty at Yetminster in Dorset, who had suffered the disease and transmitted it to his own family in 1774, his sons subsequently not getting the mild version of smallpox when later inoculated in 1789. But it was Edward Jenner, a doctor in Berkeley in Gloucestershire, who established the procedure by introducing material from a cowpox vesicle on Sarah Nelmes, a milkmaid, into the arm of a boy named James Phipps. Two months later he inoculated the boy with smallpox and the disease did not develop. In 1798 Jenner published An Inquiry into the Causes and Effects of the Variolae Vacciniae, which coined the term vaccination and created widespread interest. He distinguished 'true' and 'spurious' cowpox (which did not give the desired effect) and developed an "arm-to-arm" method of propagating the vaccine from the vaccinated individual's pustule. Early attempts at confirmation were confounded by contamination with smallpox, but despite controversy within the medical profession and religious opposition to the use of animal material, by 1801 his report was translated into six languages and over 100,000 people were vaccinated. Since then vaccination campaigns have spread throughout the globe, sometimes prescribed by law or regulations (See Vaccination Acts). Vaccines are now used against a wide variety of diseases besides smallpox. Louis Pasteur further developed the technique during the 19th century, extending its use to killed agents protecting against anthrax and rabies. 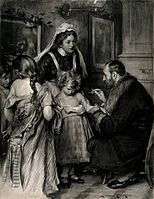 The method Pasteur used entailed treating the agents for those diseases so they lost the ability to infect, whereas inoculation was the hopeful selection of a less virulent form of the disease, and Jenner's vaccination entailed the substitution of a different and less dangerous disease for the one protected against. Pasteur adopted the name vaccine as a generic term in honor of Jenner's discovery. Maurice Hilleman was the most prolific vaccine inventor, and developed successful vaccines for measles, mumps, hepatitis A, hepatitis B, chickenpox, meningitis, pneumonia and Haemophilus influenzae. In modern times, the first vaccine-preventable disease targeted for eradication was smallpox. The World Health Organization (WHO) coordinated this global eradication effort. 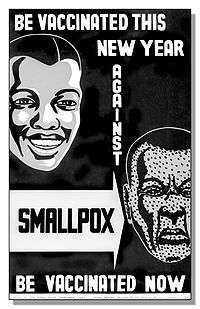 The last naturally occurring case of smallpox occurred in Somalia in 1977. In 1988, the governing body of WHO targeted polio for eradication by 2000. Although the target was missed, eradication is very close. The next disease to be targeted for eradication would most likely be measles, which has declined since the introduction of measles vaccination in 1963. In 2000, the Global Alliance for Vaccines and Immunization was established to strengthen routine vaccinations and introduce new and under-used vaccines in countries with a per capita GDP of under US$1000. GAVI is now entering its second phase of funding, which extends through 2014. To eliminate the risk of outbreaks of some diseases, at various times several governments and other institutions have employed policies requiring vaccination for all people. For example, an 1853 law required universal vaccination against smallpox in England and Wales, with fines levied on people who did not comply. Common contemporary U.S. vaccination policies require that children receive common vaccinations before entering public school. Beginning with early vaccination in the nineteenth century, these policies were resisted by a variety of groups, collectively called antivaccinationists, who object on scientific, ethical, political, medical safety, religious, and other grounds. Common objections are that vaccinations do not work, that compulsory vaccination represents excessive government intervention in personal matters, or that the proposed vaccinations are not sufficiently safe. Many modern vaccination policies allow exemptions for people who have compromised immune systems, allergies to the components used in vaccinations or strongly held objections. In countries with limited financial resources, limited coverage causes much morbidity and mortality. More affluent countries are able to subsidize vaccinations for at-risk groups, resulting in more comprehensive and effective coverage. In Australia, for example, the Government subsidizes vaccinations for seniors and indigenous Australians. Public Health Law Research, an independent US based organization, reported in 2009 that there is insufficient evidence to assess the effectiveness of requiring vaccinations as a condition for specified jobs as a means of reducing incidence of specific diseases among particularly vulnerable populations; that there is sufficient evidence supporting the effectiveness of requiring vaccinations as a condition for attending child care facilities and schools; and that there is strong evidence supporting the effectiveness of standing orders, which allow healthcare workers without prescription authority to administer vaccine as a public health intervention aimed at increasing vaccination rates. In the MMR vaccine controversy, a fraudulent 1998 paper by Andrew Wakefield, originally published in The Lancet, presented supposed evidence that the MMR vaccine (an immunization against measles, mumps and rubella that is typically first administered to children shortly after their first birthday) was linked to the onset of autism spectrum disorders. The article was widely criticized for lack of scientific rigour, partially retracted in 2004 by Wakefield's co-authors, and was fully retracted by The Lancet in 2010. Wakefield was struck off the UK's medical registry for the fraud. This Lancet article has sparked a much greater anti-vaccination movement, primarily in the United States. Even though the article was fraudulent and was retracted, 1 in 4 parents still believe vaccines can cause autism. Many parents do not vaccinate their children because they feel that diseases are no longer present due to all the vaccinations. This is a false assumption, since some diseases could still return. These pathogens could possibly infect vaccinated people, due to the pathogen's ability to mutate when it is able to live in unvaccinated hosts. In 2010, there was a whooping cough outbreak in California that was the worst outbreak in 50 years. A possible contributing factor was parents choosing to exempt their children from vaccinations. There was also a case in Texas in 2012 where 21 members of a church contracted measles because they chose to abstain from immunizations. A vaccine administration may be oral, by injection (intramuscular, intradermal, subcutaneous), by puncture, transdermal or intranasal. Several recent clinical trials have aimed to deliver the vaccines via mucosal surfaces to be up-taken by the common mucosal immunity system, thus avoiding the need for injections. The World Health Organization (WHO) estimate that vaccination averts 2-3 million deaths per year (in all age groups), and up to 1.5 million children die each year due to diseases which could have been prevented by vaccination. They estimate that 29% of deaths of children under five years old in 2013 were vaccine preventable. In other developing parts of the world, they are faced with the challenge of having a decreased availability of resources and vaccinations. Countries such as Sub-Saharan Africa cannot afford to provide the full range of childhood vaccinations. The increasing rates of vaccinations will have lasting effects on future generations; the greater the group of people who become vaccinated can ultimately drive down the spread of infection through herd immunity. German caricature showing von Behring extracting the serum with a tap. Vaccines have led to major progressions within the United States battle against disease. In 2007, studies regarding the effectiveness of vaccines on mortality or morbidity rates of those exposed to various diseases have shown almost 100% decreases in death rates, and about a 90% decrease in exposure rates. This has allowed specific organizations and states to adopt standards for recommended early childhood vaccinations. Lower income families who are unable to otherwise afford vaccinations are supported by these organizations and specific government laws. The Vaccine for Children Program and the Social Security Act are two major players in supporting lower socioeconomic groups. ↑ Fiore AE, Bridges CB, Cox NJ (2009). "Seasonal influenza vaccines". Curr. Top. Microbiol. Immunol. Current Topics in Microbiology and Immunology. 333: 43–82. doi:10.1007/978-3-540-92165-3_3. ISBN 978-3-540-92164-6. PMID 19768400. ↑ Chang Y, Brewer NT, Rinas AC, Schmitt K, Smith JS (July 2009). "Evaluating the impact of human papillomavirus vaccines". Vaccine. 27 (32): 4355–62. doi:10.1016/j.vaccine.2009.03.008. PMID 19515467. ↑ Liesegang TJ (August 2009). "Varicella zoster virus vaccines: effective, but concerns linger". Can. J. Ophthalmol. 44 (4): 379–84. doi:10.3129/i09-126. PMID 19606157. United States Centers for Disease Control and Prevention (2011). A CDC framework for preventing infectious diseases. Accessed 11 September 2012. "Vaccines are our most effective and cost-saving tools for disease prevention, preventing untold suffering and saving tens of thousands of lives and billions of dollars in healthcare costs each year." Gellin, Bruce, MD, MPH. "Vaccines and Infectious Diseases: Putting Risk into Perspective". (Remarks at AMA Briefing on Microbial Threats.) American Medical Association. 1 June 2000. Accessed 4 September 2016. "Vaccines are the most effective public health tool ever created." Public Health Agency of Canada. Vaccine-preventable diseases. Accessed 11 September 2012. "Vaccines still provide the most effective, longest-lasting method of preventing infectious diseases in all age groups." United States National Institute of Allergy and Infectious Diseases (NIAID). NIAID Biodefense Research Agenda for Category B and C Priority Pathogens. Accessed 11 September 2012. "Vaccines are the most effective method of protecting the public against infectious diseases." ↑ World Health Organization, Global Vaccine Action Plan 2011-2020. Geneva, 2012. ↑ "Tetanus" (PDF). Retrieved 2014-03-01. 1 2 Lombard M, Pastoret PP, Moulin AM (2007). "A brief history of vaccines and vaccination". Rev. - Off. Int. Epizoot. 26 (1): 29–48. PMID 17633292. ↑ Behbehani AM (1983). "The smallpox story: life and death of an old disease". Microbiol. Rev. 47 (4): 455–509. PMC 281588 . PMID 6319980. 1 2 Plett PC (2006). "Plett and other discoverers of cowpox vaccination before Edward Jenner". Sudhoffs Arch (in German). 90 (2): 219–32. PMID 17338405. Retrieved 2008-03-12. ↑ Riedel S (2005). "Edward Jenner and the history of smallpox and vaccination". Proc (Bayl Univ Med Cent). 18 (1): 21–5. PMC 1200696 . PMID 16200144. ↑ "UC Davis Magazine, Summer 2006: Epidemics on the Horizon". Retrieved 2008-01-03. ↑ How Poxviruses Such As Smallpox Evade The Immune System, ScienceDaily, 1 February 2008. ↑ "Vaccine Overview" (PDF). Smallpox Fact Sheet. Retrieved 2008-01-02. ↑ Rupprecht CE, Briggs D, Brown CM, et al. (March 2010). "Use of a reduced (4-dose) vaccine schedule for postexposure prophylaxis to prevent human rabies: recommendations of the advisory committee on immunization practices". MMWR Recomm Rep. 59 (RR–2): 1–9. PMID 20300058. ↑ "Immunity Types". Centers for Disease Control and Prevention. Retrieved 20 October 2015. ↑ http://www.npl.co.uk/environment/vam/nongaseouspollutants/ngp_metals.html Archived 29 September 2007 at the Wayback Machine. ↑ "The Smallpox Epidemic of 1862 (Victoria BC)--Doctors and Diagnosis". web.uvic.ca. Retrieved 2016-09-29. ↑ "Doctors and diagnosis ''The difference between Vaccination and Inoculation''". Web.uvic.ca. Retrieved 2014-01-08. ↑ "Edward Jenner - (1749–1823)". Sundaytimes.lk. 2008-06-01. Retrieved 2009-07-28. ↑ "History - Edward Jenner (1749 - 1823)". BBC. Retrieved 2014-03-01. 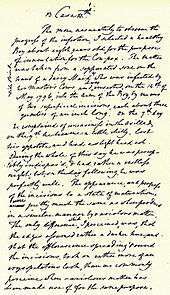 ↑ "Edward Jenner - Smallpox and the Discovery of Vaccination". dinweb.org. ↑ Diseases of Poultry, 11th ed. Y. M. Saif et al., editors. Iowa State University Press, Ames, IA, 2003. ↑ Chaumeton, F.P. ; F.V. Mérat de Vaumartoise. "inoculation" Dictionaire des sciences médicales. Paris: C.L.F. Panckoucke, 1812-1822, lvi (1821). ↑ Needham, Joseph. (2000). Science and Civilization in China: Volume 6, Biology and Biological Technology, Part 6, Medicine. Cambridge: Cambridge University Press. Page 134. ↑ Gross, Cary P.; Sepkowitz, Kent A. (July 1998). "The Myth of the Medical Breakthrough: Smallpox, Vaccination, and Jenner Reconsidered". International Journal of Infectious Diseases. 3 (1): 54–60. doi:10.1016/s1201-9712(98)90096-0. ↑ Offit PA (2007). Vaccinated: One Man's Quest to Defeat the World's Deadliest Diseases. Washington, DC: Smithsonian. ISBN 0-06-122796-X. ↑ Wolfe R, Sharp L (2002). "Anti-vaccinationists past and present". BMJ. 325 (7361): 430–2. doi:10.1136/bmj.325.7361.430. PMC 1123944 . PMID 12193361. ↑ Salmon DA, Teret SP, MacIntyre CR, Salisbury D, Burgess MA, Halsey NA (2006). "Compulsory vaccination and conscientious or philosophical exemptions: past, present, and future". Lancet. 367 (9508): 436–42. doi:10.1016/S0140-6736(06)68144-0. PMID 16458770. ↑ Sharmila L Mhatre; Anne-Marie Schryer-Roy (2009). "The fallacy of coverage: uncovering disparities to improve immunization rates through evidence. Results from the Canadian International Immunization Initiative Phase 2 - Operational Research Grants.". BMC International Health and Human Rights. 9 (Suppl 1): S1. doi:10.1186/1472-698X-9-S1-S1. PMC 3226229 . PMID 19828053. ↑ "Time to think about vaccinations again", Medicines Talk, Sydney, 3 February 2010. ↑ "Laws and Policies Requiring Specified Vaccinations among High Risk Populations". Public Health Law Research. 7 December 2009. Retrieved 2014-11-19. ↑ "Vaccination Requirements for Child Care, School and College Attendance". Public Health Law Research. 12 July 2009. Retrieved 2014-11-19. ↑ "Standing Orders for Vaccination". Public Health Law Research. 12 July 2009. Retrieved 2014-01-08. ↑ The Editors Of The Lancet (February 2010). "Retraction—Ileal-lymphoid-nodular hyperplasia, non-specific colitis, and pervasive developmental disorder in children". Lancet. 375 (9713): 445. doi:10.1016/S0140-6736(10)60175-4. PMID 20137807. Lay summary – BBC News (2010-02-02). ↑ Meikle, James; Boseley, Sarah (24 May 2010). "MMR row doctor Andrew Wakefield struck off register". The Guardian. London. Archived from the original on 27 May 2010. Retrieved 24 May 2010. ↑ Matthew F. Daley; Jason M. Glanz. "Straight Talk about Vaccination". scientificamerican.com. ↑ "WHO - World Immunization Week 2012". who.int. 1 2 "Anti-Vaccination Movement Causes a Deadly Year in the U.S.". Healthline. 3 December 2013. ↑ "Possible Side-effects from Vaccines". 1 2 Sugarman SD (2007). "Cases in vaccine court—legal battles over vaccines and autism". N Engl J Med. 357 (13): 1275–7. doi:10.1056/NEJMp078168. PMID 17898095. ↑ Nichol, Kristin L. (22 July 1996). "Side Effects Associated With Influenza Vaccination in Healthy Working Adults". Archives of Internal Medicine. 156 (14). doi:10.1001/archinte.1996.00440130090009. ISSN 0003-9926. ↑ Oraby, Tamer; Thampi, Vivek; Bauch, Chris T. (7 April 2014). "The influence of social norms on the dynamics of vaccinating behaviour for paediatric infectious diseases". Proc. R. Soc. B. p. 20133172. doi:10.1098/rspb.2013.3172. ↑ Plotkin, Stanley A. (2006). Mass Vaccination: Global Aspects - Progress and Obstacles (Current Topics in Microbiology & Immunology). Springer-Verlag Berlin and Heidelberg GmbH & Co. K. ISBN 978-3-540-29382-8. ↑ Fujkuyama, Y; Tokuhara, D; Kataoka, K; Gilbert, RS (2012). "Novel vaccine development strategies for inducing mucosal immunity". Expert Rev Vaccines. 11 (3): 367–79. doi:10.1586/erv.11.196. PMC 3315788 . PMID 22380827. ↑ "Global Immunization Data" (PDF). ↑ Ehreth, Jenifer (30 January 2003). "The global value of vaccination". Vaccine. 21 (7–8): 596–600. doi:10.1016/S0264-410X(02)00623-0. Retrieved 15 November 2016. ↑ Roush, Sandra W. (14 November 2007). "Historical Comparisons of Morbidity and Mortality for Vaccine-Preventable Diseases in the United States". JAMA. doi:10.1001/jama.298.18.2155. Largent, Mark A. (2012). Vaccine: The Debate in Modern America. Baltimore: Johns Hopkins University Press. ISBN 978-1-4214-0607-7. Walloch, Karen L. The Antivaccine Heresy: Jacobson v. Massachusetts and the Troubled History of Compulsory Vaccination in the United States (University of Rochester Press, 2015). xii, 339 pp. 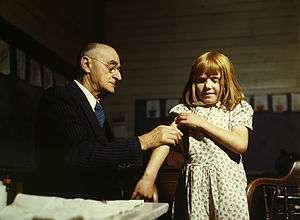 Wikimedia Commons has media related to Vaccinations. The Vaccine Page links to resources in many countries.